Fastlanes™. Innovation for real life. Portal is different by design. It is built to work for you in real life. Everyday, your WiFi slows down when people nearby use the Internet. That's why Portal innovated something entirely new to keep your WiFi reliably fast no matter how many people and devices are around your home. Introducing Portal's patented FastLanes™ technology. If you see five or more networks when connecting to your home WiFi, chances are your Internet is slower than it should be. In apartments, condos, busy neighborhoods and crowded urban areas, networks compete with each other. This means more buffering, interruptions, and slower speeds than you pay for. Portal fixes this. Portal analyzes your environment to unlock clean DFS channels in the 5GHz range. It is the only router certified to operate on these channels because it uses radar-sensing hardware. This gives you performance that's unheard of in a device of this size, and leaves your neighbors envious of your reliably fast WiFi network. 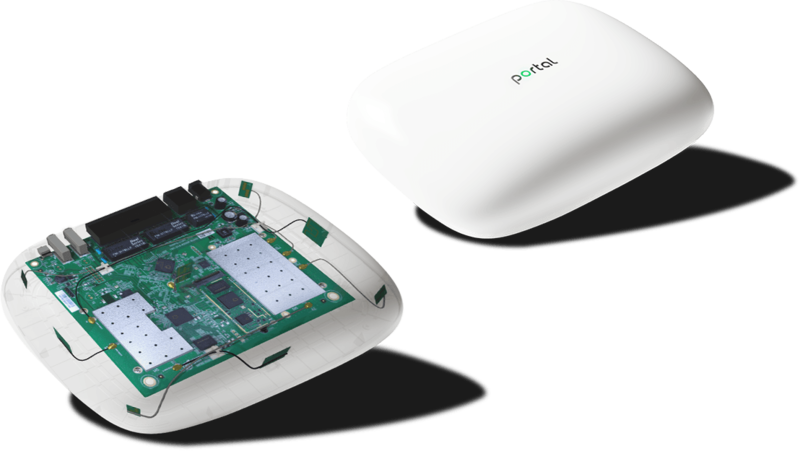 Designed for those who crave simplicity, the Portal Smart WiFi router is friendly yet fierce. Here are some in-depth 3D Models to play with and the Technical Specs for your inner nerd.